Bigger is better. The trend in church thinking in the 90s. The megachurch. But is it true? I know that personally I have been in several church homes. An extremely large one growing up, an extremely small one thru my teens and early 20s and then a mid-sized/smallish church from my mid 20s thru today (mid 30s). I have experienced the large church that allows people to "hide" or take advantage of church programs and services. I have been in the small church that needed all its members to pull off an event. I know it comes down to a personal preference. 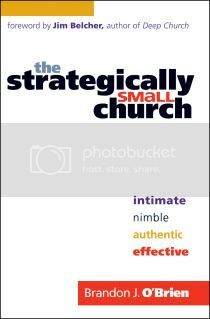 In reading The Strategically Small Church, I was amazed at how much it identifies my personal feelings about a church home. While the book is meant for pastors and ministry leaders (I do not belong to either group), I felt the author expressed much of what I would like pastors to know. O'Brien discussed the trend to authenticity as a standard for gen Xers. I know this rings true for me. I cannot stand "fake". He mentions that our generation is "suspicious, sarcastic and unimpressed". Not flattering, but true. We want "genuine" and all the mess that surrounds it. Small churches tend toward the ability for more authentic relationships and faith. The book also discusses church programming, the attitude of consumerism, the training up of other leaders, the equipping of the congregation and the benefit of the intergenerational church. I particularly agreed with the idea of the church being a "family", especially for those alone, or separated from family. I agree with the idea of eliminating age-based groups and encouraging interaction/groups irregardless of age. Ideal resource for pastors and ministry directors! Brandon J. O'Brien is editor-at-large for Leadership Journal and their poular blog, Out of Ur. He holds an MA in church history from Wheaton College and served as pastor of two small congregations. Bradon lives with his wife in the western suburbs of Cchicago, where he is a doctoral student in church history at Trinity Evangelical Divinity school. This book was provided for review by Bethany House Publishers.